The world’s six richest countries – responsible for more than half of global GDP – host less than one-tenth of the world’s refugees, according to a new Oxfam report . The number of people forced to flee their homes is at an all-time high. Over 65 million are estimated to have been displaced, including more than 20 million refugees. But the responsibility for these refugees has fallen disproportionately on poorer nations. “Poorer countries are shouldering the duty of protecting refugees when it should be a shared responsibility, but many richer countries are doing next to nothing,” Winnie Byanyima, Executive Director of Oxfam International, said in a press release . Using the latest UN refugee and World Bank GDP figures , the Oxfam report lays bare the global divide in hosting refugees. The world’s six richest countries account for 56.5% of cumulative global GDP, yet host just 8.88% of the world’s refugees. 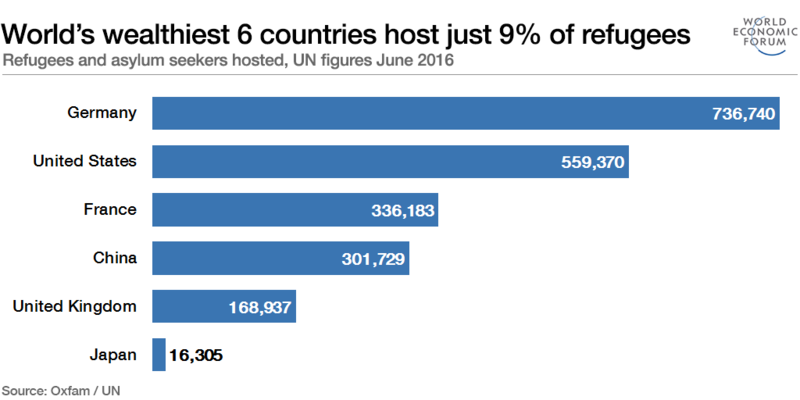 The United States, China, Japan, Germany, the UK and France host some 2.1 million refugees between them. Germany hosts the most, with nearly three-quarters of a million refugees. The US and France follow. Conversely, the UK hosts a little over a quarter of a million, while Japan hosts less than 20,000. At the other end of the scale, the six countries and territories holding the most refugees – half of the global total – account for just 1.9% of cumulative global GDP. These six currently have close to 12 million refugees, with Jordan and Turkey hosting the most. Between them the two nations host over 5.5 million. Also on the list are Pakistan, the Occupied Palestinian Territory, Lebanon and South Africa. "The international displacement we are seeing is an unprecedented and complex challenge requiring a coordinated global response,” said Byanyima. “The richest countries need to be part of the solution and do their fair share by welcoming and protecting more refugees."